Once again, opponents of a Neal Communities development called Grand Lakes have failed in an attempt to stop the project. This was their final effort to try to halt construction of up to 1,097 homes on 533 acres south of Clark Road and east of Interstate 75. In August 2018, Sarasota County residents who live near the site planned for Grand Lakes filed two legal challenges, arguing the County Commission erred in approving Grand Lakes. 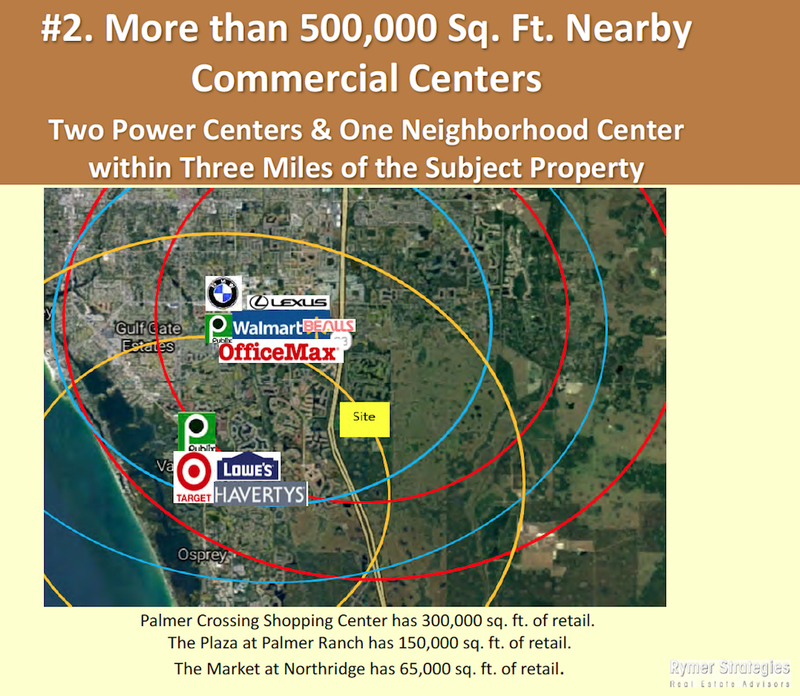 The Ibis Road team members argued that Grand Lakes did not need a retail/commercial Village Center for the residents, as required by Sarasota 2050. 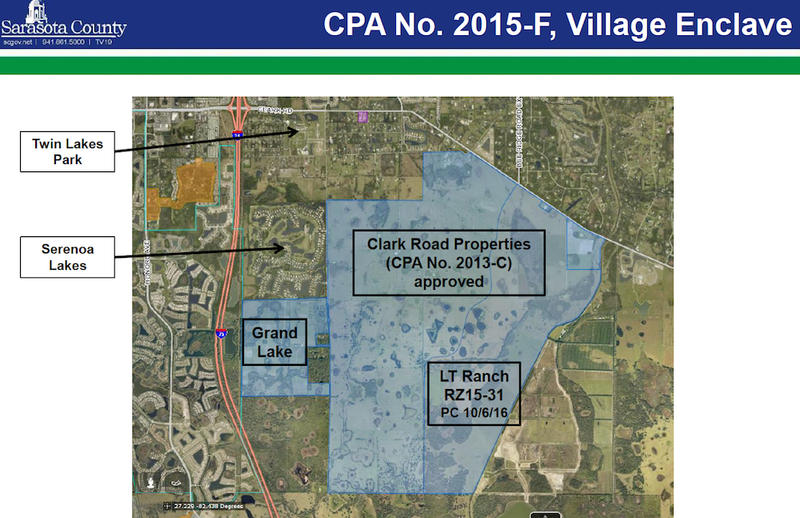 The LT Ranch Village, slated to be built 2.5 miles east of Grand Lakes, would have a Village Center with 300,000 square feet of non-residential uses, they told the commission. In the meantime, Grand Lakes residents would be close enough to existing businesses that could satisfy their retail and office needs, the Ibis Road team contended. 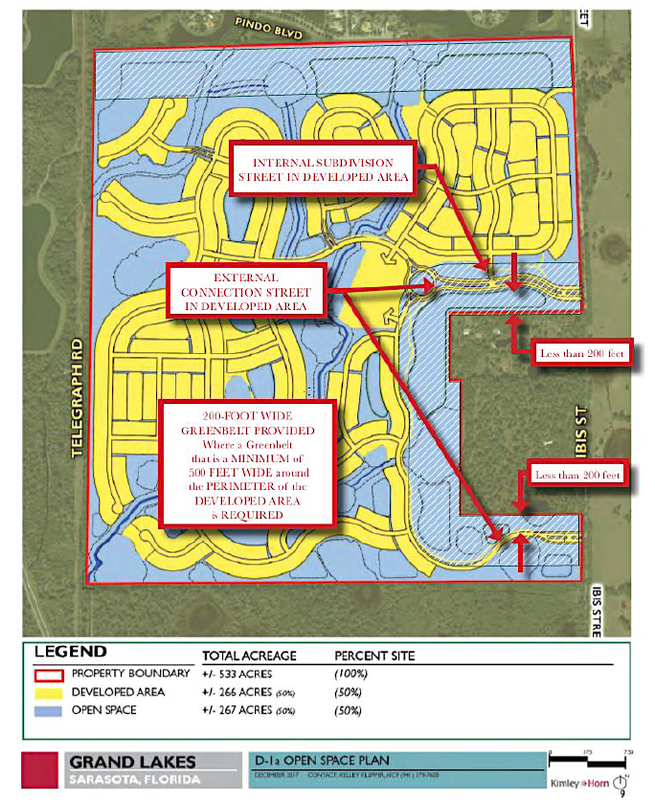 Kelly Klepper, senior planner/project manager with Kimley-Horn and Associates of Sarasota, which served as a consultant to Ibis Road, pointed out that the closest retail center to Grand Lakes would be just 3.6 miles away, even with the current road network. Finally, Klepper argued that national and regional retailers with whom the team had been in contact had shown no interest in locating businesses in a Village Center in Grand Lakes. As a businessman himself, Commissioner Michael Moran told Klepper, “I wouldn’t even consider doing a mailer there,” if the community had only 1,000 homes, “let alone putting an office there.” It is a question of how many residents can “feed” commercial properties, Moran added. As a result, the County Commission voted unanimously to approve the Comprehensive Plan amendment that Ibis Road sought. 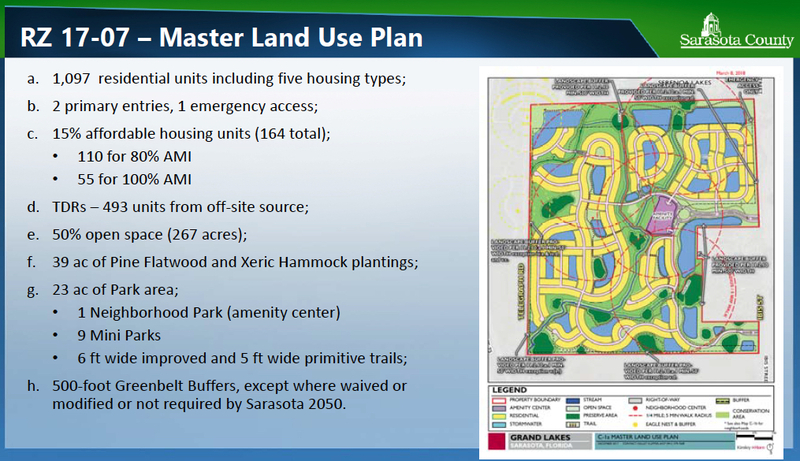 The amendment modified the Sarasota 2050 development regulations to allow the elimination of what the policy refers to as a “Village Center” of mixed uses if another Sarasota 2050 development in the area will have such a center. The Grand Lakes opponents filed a challenge of the legality of that amendment with the Florida Division of Administrative Hearings (DOAH). Ffolkes found that the proposed change to the Sarasota 2050 policy was “in compliance” with the applicable chapter of the Florida Statutes, DOAH records show. “Sarasota 2050 is a system designed to encourage preservation of open space by allowing the transfer of density into developments called Villages and Hamlets,” Ffolkes explained in her Recommended Order. 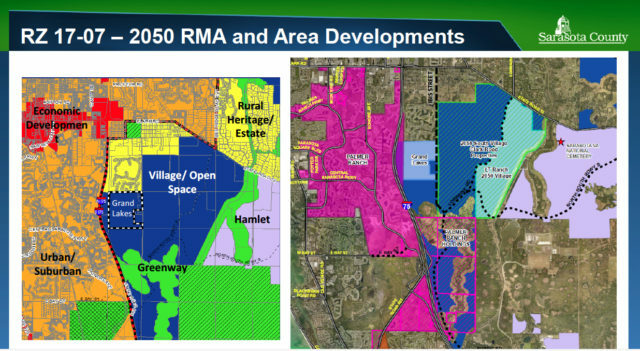 It also “offers … property owners significant density incentives, as well as opportunities for non-residential development if they develop their properties according to the Sarasota 2050 Village criteria,” she continued. “Within these Village Areas,” she continued, “there are multiple property owners,” and “several Villages [may be] within each Village Area. 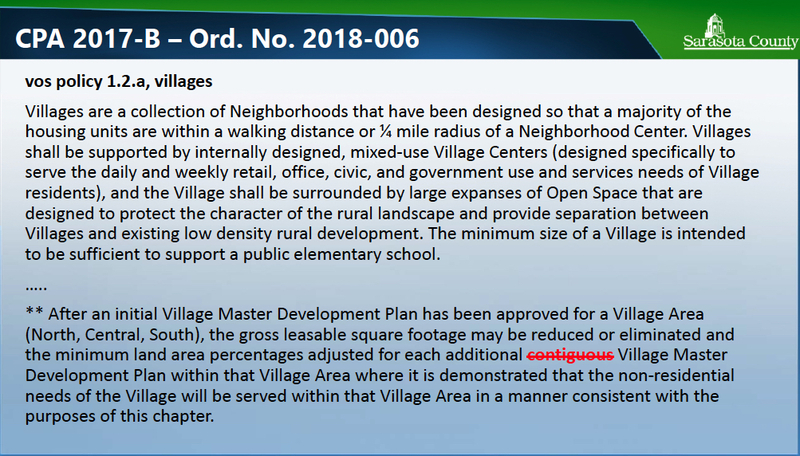 Under the 2050 regulations, she wrote, “Villages have a minimum open space requirement of 50 percent and the remainder of the Village is called the Developed Area.” The latter, she noted, comprises the Village Center and the Neighborhoods. On April 15, the DEO issued its Final Order in the case, based on Ffolkes’ recommendation, County Attorney Frederick “Rick” Elbrecht reported to the County Commission during its regular meeting on April 23. “The [Sarasota 2050] amendment is now in effect,” Elbrecht added. Deputy County Attorney Alan Roddy represented the county in the legal challenge, Elbrecht noted on April 23. No commissioner offered a comment after Elbrecht provided the update. 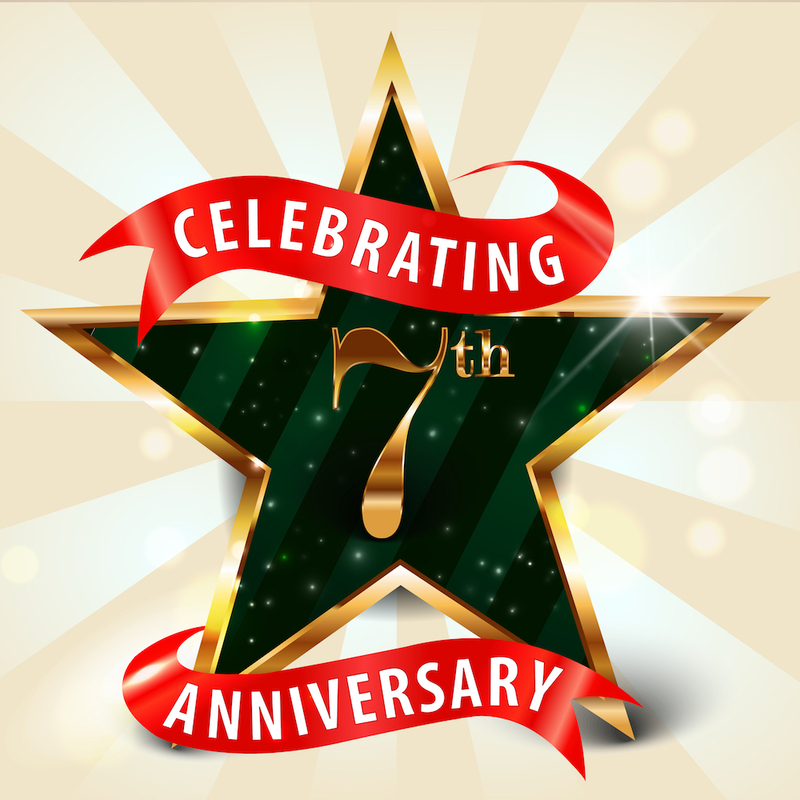 In December 2018, in a companion case the Grand Lakes opponents filed in the 12th Judicial Circuit Court, the presiding judge also issued a favorable ruling for Sarasota County. Circuit Judge Frederick P. Mercurio said the County Commission applied the correct law and regulations in its July 2018 actions. The petitioners had contended that the commission violated county regulations regarding green and open space on the site and that it was wrong not to allow their representative more time during public hearings to detail their objections to facets of the project. One of the plaintiffs in both the Circuit Court case and the DOAH challenge was David Anderson, president of the Serenoa Lakes Community Association. Serenoa Lakes is north of the Grand Lakes site. In response to a Sarasota News Leader request for comment following County Attorney Elbrecht’s comments this week, Anderson wrote in an April 24 email, “We disagree with the DEO’s decision that the County is free to ignore one of the Sarasota 2050 Plan’s three Core Principles — New Urbanism — when approving Village developments east of I-75. Anderson added, “We are displeased that the county has seemingly chosen to encourage low density, automobile-dependent sprawl rather than defend the fundamental framework of the 2050 plan, which is intended to strike a balance between the development community’s desire for increased density and the public’s desire for development that pays its own way, for compact, walkable interconnected development, and large areas of open space. 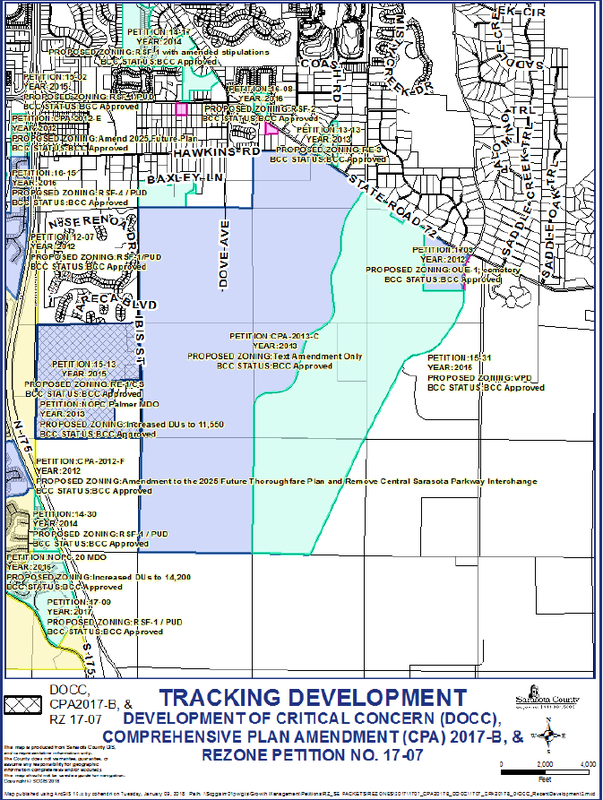 In the 12th Judicial Circuit Court case, the petitioners argued that the Grand Lakes application to the county included an outdated map that did not label creeks on the development site. They contended that the latest USGS topographical map for the area showed South Creek traversing the northwest corner of the property and continuing along the western boundary. The News Leader also contacted Gayle Reynolds of the Manatee-Sarasota Sierra Club for comments, as that nonprofit and 1000 Friends of Florida Inc. provided “financial support and legal assistance” to the plaintiffs, as Anderson pointed out to the News Leader in an Aug. 13, 2018 telephone interview. She added, “We believe the long term effects of those changes, as approved by the [commissioners] and now [Administrative Law Judge Ffolkes and Circuit Judge] Mercurio will prove to be devastating to the environment and quality of life for all residents going forward. “The diminishment of Village open space and greenbelt requirements and the requirements for contiguous commercial town centers have now been removed, most remarkably, by the [County Commission] and now the opinions of [the judges],” Reynolds continued. 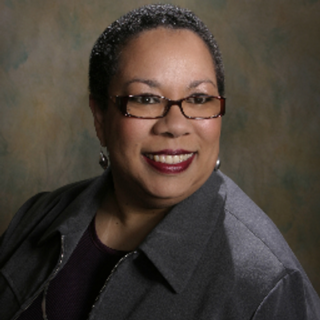 “Our community endured a very long, arduous and expensive process to develop the 2050 Plan. The promise of 2050 was to create a better form of development, based on the principles of New Urbanism. That promise has been chipped away, reduced to nothing more than traditional urban sprawl and the very same gated, tract house subdivisions the public was promised the 2050 plan would end. “There is no level playing field for the public with this Board of County Commissioners,” Reynolds wrote. “The only recourse citizens have is to take to the courts, if they have standing. But that’s an extremely expensive and high risk game for average citizens and now the courts are failing us as well,” she concluded her statement. The News Leader also contacted Scott McLaren of the Tampa law firm Ward Hill Henderson, who represented the project team — Ibis Road Investors — in the legal challenges. Both Administrative Law Judge Ffolkes and Circuit Judge Mercurio allowed Ibis Road to participate in the cases as an intervenor.